A standard tour of the metro goes between Puhung and Kaeson Stations, stopping at Yonggwang Station (and sometimes Tongil and Ponghwa Stations too) along the way. These are the three most grandly decorated stops. 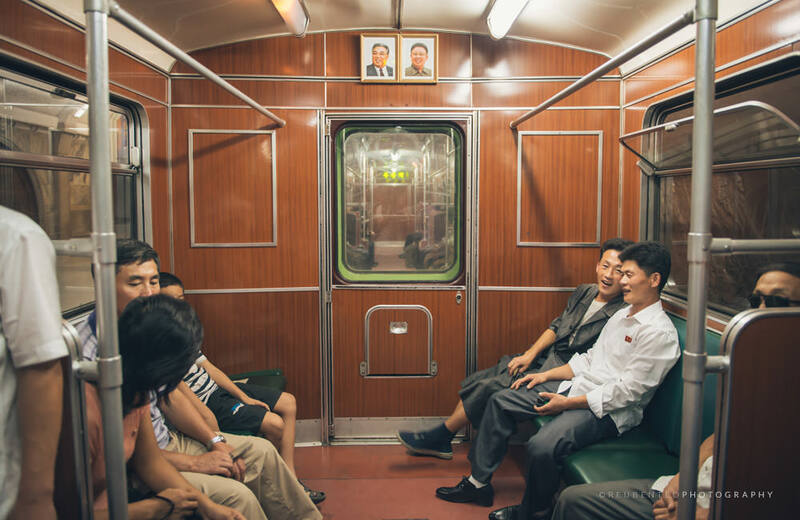 An extended tour of the Metro costs 25 euros (also payable in Chinese yuan or USD). With such a tour it is possible to get off and see every stop on the Metro. Rush hour is a good time to visit to experience a bit of hustle and bustle. Construction began in 1965, with stations opening from 1969 until 1972. 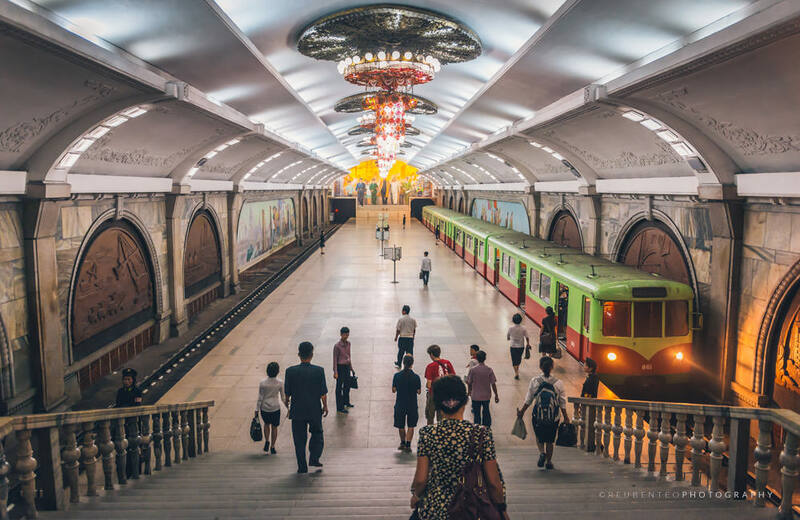 Most of the stations were built during the 70s, but the two most grand—Puhung and Yonggwang—were opened in 1987. New, modern train carriages with in-built television screens and electronic stop notifications were added in 2016. *”Three Flourishings” refers to the cultivation of the three virtues Korean education aspires to. These are the moral, intellectual, and physical (지(智)·덕(德)·체(體)). This choice of name is likely related to this station’s position next to Kim Il Sung University. Kaeson Station features a bronze statue of Kim Il Sung giving his 1945 speech upon returning to Korea from Manchuria. The mural opposite the Arch of Triumph upstairs depicts the same event. 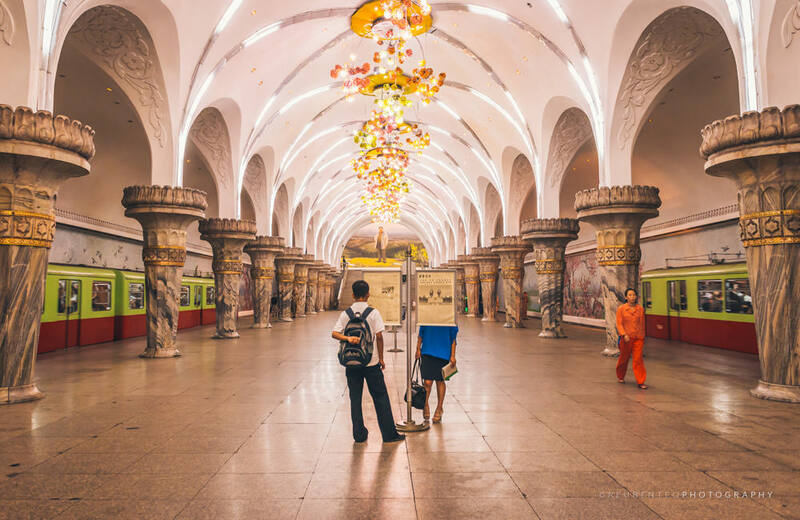 Yonggwang Station features elaborate mosaics on each side of the platform depicting Pyongyang. 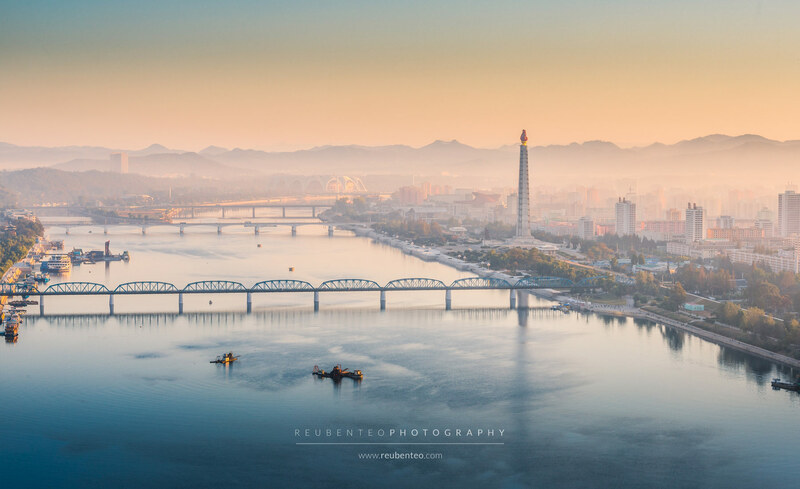 Standing on the platform, it is as if the viewer is positioned in the Taedong River, and looking at the East and West and sides of the river. The chandeliers are supposed to resemble fireworks above. 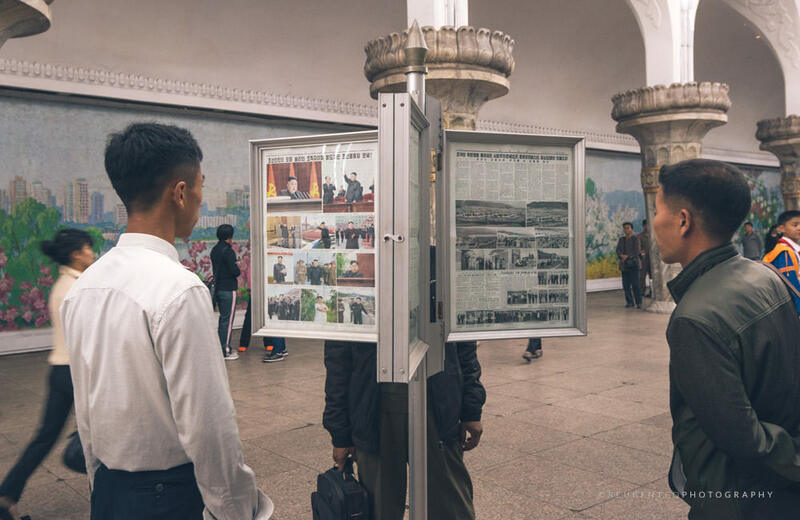 The mural of Kim Il Sung with factory workers at Puhung Station features a light that permanently shines onto Kim Il Sung’s face. The logo features the Korean syllabic block “ji” (지; 地), meaning “ground”. It is the first of three blocks in “ji-ha-chol” (지하철; 地下鐵), the Korean word for “subway” or “metro”. “Ji” = ground, “ha” = under, “chol” = literally iron, but here means rail.